In the middle of winter driving home “It’s America” by Rodney Atkins came on the radio. I belted out the tune, thinking to myself “I love this song.” Honestly I love all of Rodney Atkins song, how can you not (if your not a country music fan, it’s cool). 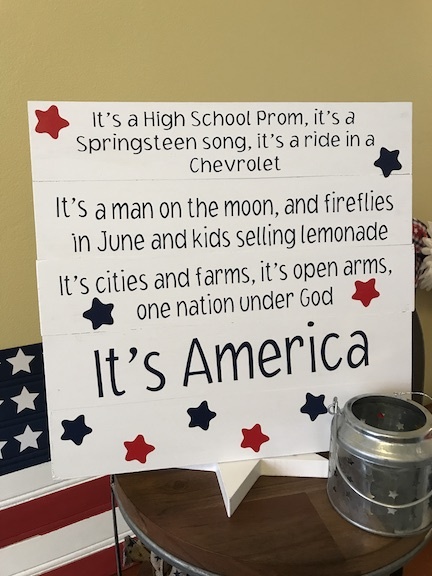 The chorus of this song is perfect for a patriotic sign. 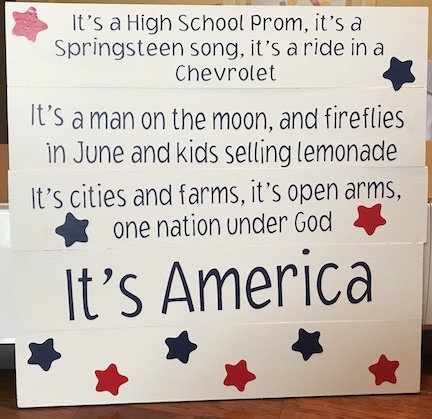 I couldn’t wait for it to get closer to the 4th of July to create this and it’s perfect for this months Craft and Create Cricut Challenge. To create a sign, of course you need a sign. I created one using pieces of extra plywood leftover from our kitchen cabinets. The sign is an 11×11 and each piece of plywood is 2 inches tall. I used wood glue to hold the sign together. I put something heavy on it and left it over night. 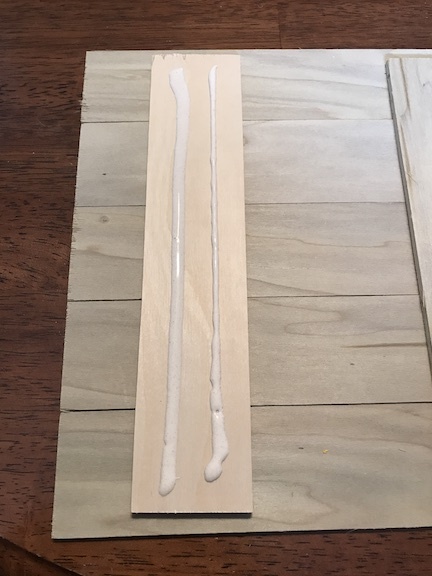 Then I sanded the edges and painted it white. You can just head to the craft store and buy a pallet sign to, just do what works for you! This is the fun part. Now that the sign is painted white, I’m going to use Oracal 641 in dark blue for the chorus. I love this vinyl! It’s permanent just like Oracal 651, but it has a matte finish and looks great on signs and more like paint then vinyl. First though I should share how I did this in Cricut Design Space™. I created rectangles the size of each piece of wood on the sign. 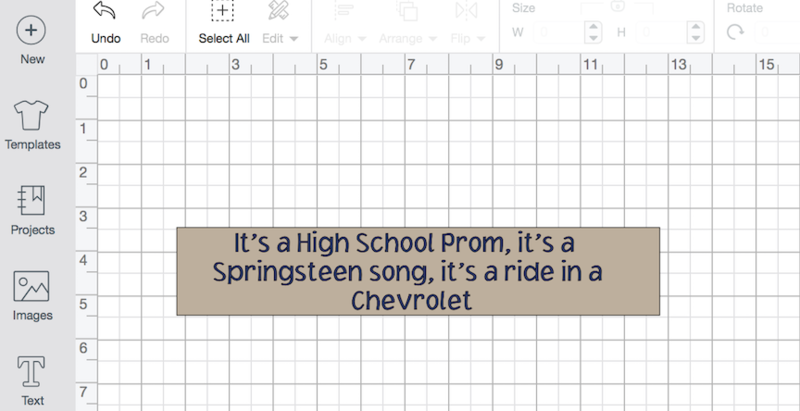 Then I added the text for each rectangle and used the font Jacoby Extra Light with my Cricut Access Premium. 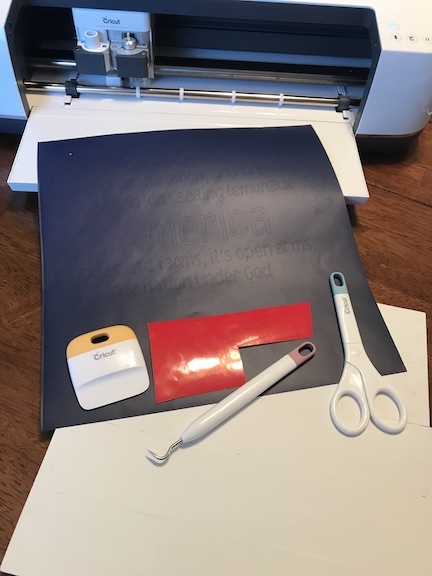 I highly recommend the Cricut Access Premium for the fonts, shapes, and images. I had one extra piece of wood on the sign so I added stars in red and blue. 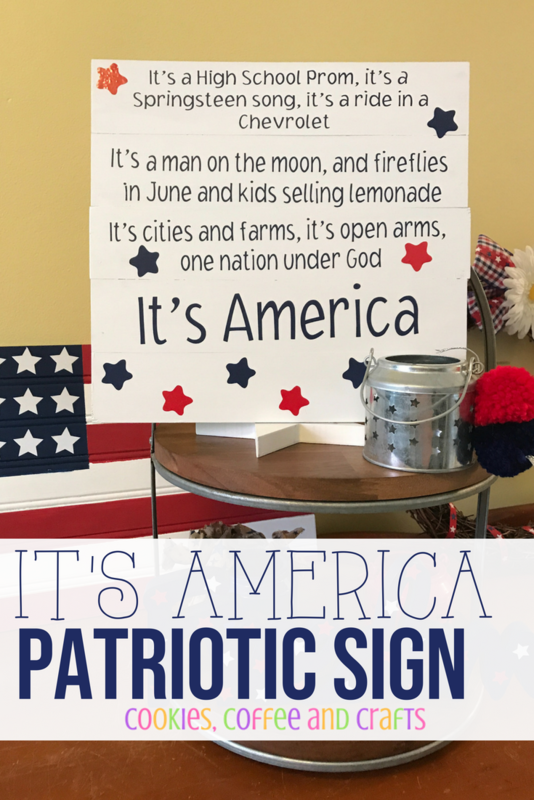 Here is what my finished patriotic sign looks like in Design Space. I will hide the rectangles and hit Make It. 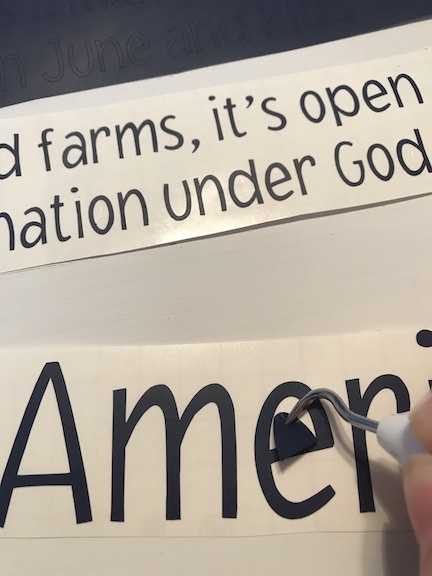 I will carefully weed my design and use transfer tape to add it to the sign. As I was weeding I realized these song lyrics have a lot of “i”, but I made it through. I decided to put the stars randomly at the bottom of the sign and had one star leftover. It looked cute by the lyrics so I added a few more stars. It matches my other 4th of July decorations perfectly. 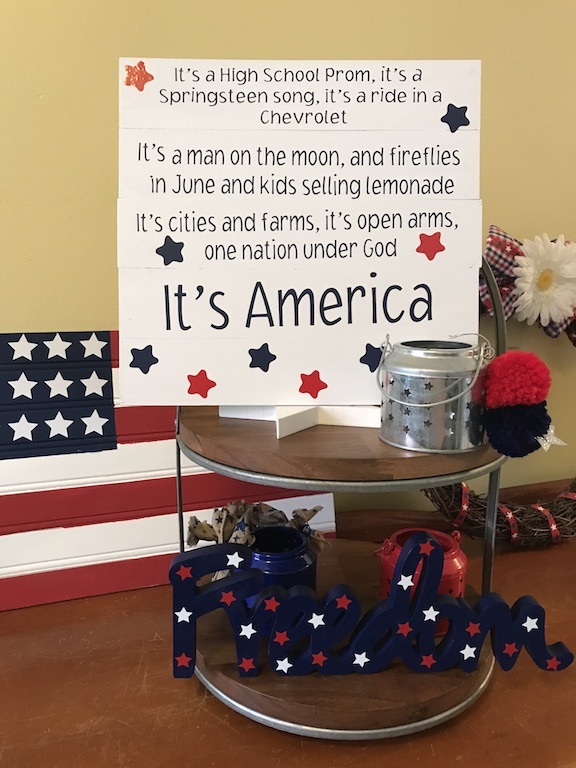 I’m ready for the 4th of July and this sign will be a perfect addition to my decorations. 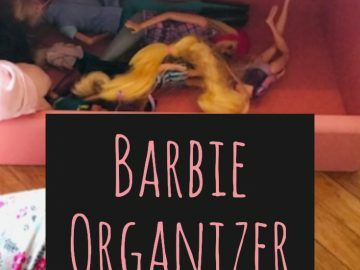 I will probably sing it every time I see it and drive my husband crazy. 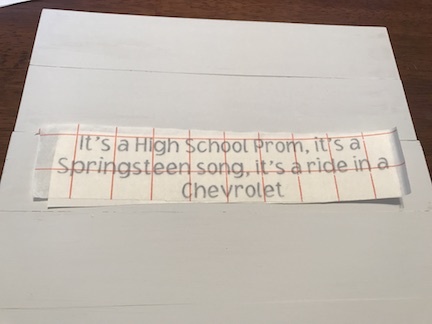 I’m going to use this idea again because songs speak to us and what a great way to add your favorite songs to your home decor. 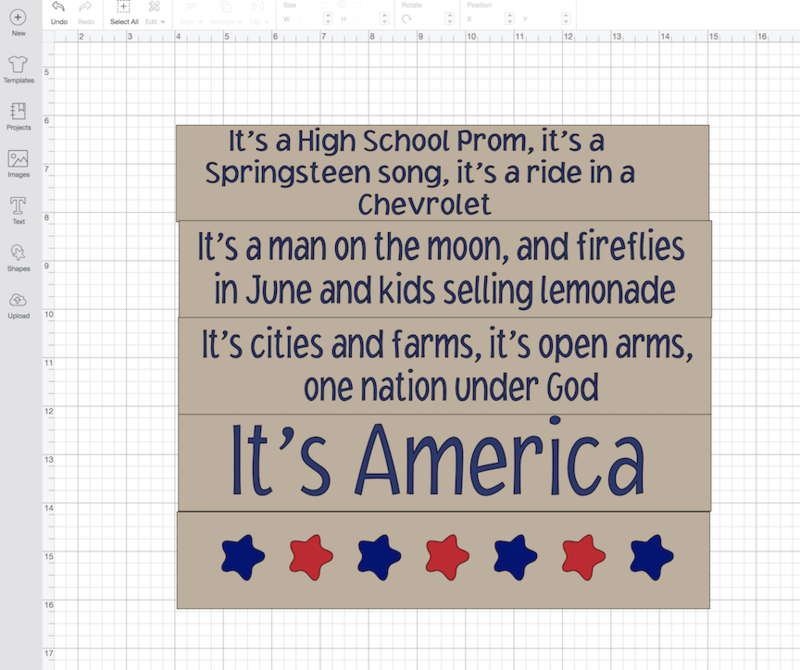 Visit my Cricut Blogging Friends and see all the amazing patriotic projects they created.